I'm just in the process of publishing my latest research for the LEF, so it's time to move on to a new area of research. Before I do, I thought I'd post something about the past research and a quick summary of a few of the points worth noting. Explosions of industrial creativity rarely follow the invention, discovery or subsequent innovation of a technology but instead its commoditisation i.e. it wasn't the discovery of electricity but Edison's introduction of utility services for electricity that produced the creative boom that led to recorded music, modern movies, consumer electronics and even Silicon Valley. However, utility provision of electricity did more than just create a new world, it disrupted existing industries (both directly and through reduced barriers of entry), it also allowed for new practices and methods of working to emerge and even resulted in new economic forms - such as Henry Ford's Fordism. This isn't a one off pattern. The cycle of innovation / commoditisation repeats throughout our industrial history, following a surprisingly consistent pathway. Understanding this pattern is critical to anticipating the changes emerging in our industry today - whether that's the web, cloud computing or the future changes that 3D printing will bring. The actual cycle itself is rather simple but as with all things it creates complex interactions. I've tried to summarise some of the effect in figure 1 (below) and I'll go through it in the general notes. 1. All business activities evolve through a common pathway. This pathway is defined by how ubiquitous and certain (i.e. well understood & defined) an activity is. The relationship between these two I have previously discussed on many occasions. What's important to remember is that activities evolve through domains including genesis, custom built examples, products (including rental services) and commodity (including utility services). 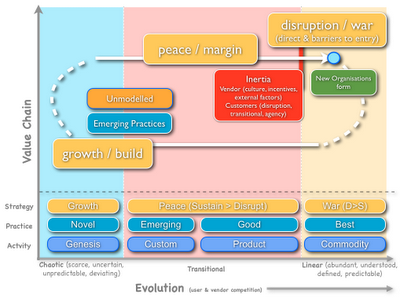 What drives the process of evolution is user and vendor competition - i.e. the need for something and the desire to supply that need and outcompete others. 2. It's not just activities (what we do) that evolves but also practice (how we do something). Practices evolve through equivalent domains - novel, emerging, good and best (known as the cynefin framework). It's important to remember that practices can, and often do, co-evolve with activities. For example, best practice for resilience and scaling with computing infrastructure products (the activity) was N+1 and scale-up. As the activity evolved to more of a commodity this enabled emerging practices such as design for failure. These emerging practices will evolve over time to become best practice for a utility infrastructure world. 3. Practices and activities can themselves be grouped into three stages - chaotic, transitional and linear. Chaotic activities (i.e. genesis to custom built) are scarce by nature, poorly understood, uncertain, rapidly changing, deviation is desirable, serendipity matter and they are a source of future worth. Over time the same activity becomes abundant, well defined, predictable, measurable, deviation is undesirable and nothing more than a cost of doing business. 4. The process of evolution creates a cycle i.e. as activities become more of a commodity they enable new (higher order) activities to develop - i.e. utility provision of electricity lead to consumer electronics. This is standard componentisation and it often has a dramatic effect causing a rapid growth in genesis of new activities. 5. The cycle itself has different states - war (disruption), growth (build) and peace (margin). Each state is suitable for different strategies and approaches. For example in the peace state, competition between competitors is relative with sustaining change tending to exceed disruptive. In the war state, competition is a fight for survival and disruptive change exceeds sustaining. How much this impacts you depends upon the activity in question and whether you're directly effected (i.e. it's something you produce) or it's a barrier to entry into your business. 6. The cycle is controlled by inertia barriers for both customer and vendor. On the customer side these are normally referred to as "risks" such as disruption (loss of skillset, political capital etc), transition (trust in new suppliers, transparency, change in governance etc) and agency (loss of strategic control, lock-in, lack of pricing competition etc). On the vendor side these inertia barriers are built upon from past success and include such things as culture, incentives, structure and external forces (such as financial markets). This is why the inertia barriers are often broken by a company that is not encumbered by the previous model (e.g. Amazon vs Hosting companies). 7. The cycle itself can be local to a specific industry (i.e. range of activities) or can have major macro-economic effects. Whether it does depends upon if the activity can be a component of future activities, the number of activities built up behind the inertia barriers and if the activity can enable others to cross the inertia barriers. The macro economic waves that we see are known as Kondratiev waves and we often refer to them as 'ages' - industrial age, mechanical age etc. 8. During the war state, new forms of organisation appear. These organisations have different strategies, practices and activities than previous organisations. Over time the practices of this next generation diffuse i.e. utility provision of electricity enabled the development of Fordism which spread to become a major influencing factor on most companies. 9. During each of the cycles, we see rapid increases in un-modelled data. It's not unstructured, simply we don't know how to model it as it's in the chaotic (i.e. uncertain, constantly changing) state. Over time we attempt to model this data generally leading to arguments over schemas and classification and technology etc. We've seen this in both Georgian (first industrial age) and Victorian ages (mechanical and railways age) and every subsequent age. * there are multiple accelerators and de-accelerators to the process of evolution. * there are forcing strategies which companies can deploy i.e. use of open source, network effects etc. * there are many counter strategies which companies can deploy i.e. use of patents, branding, legal system and ownership of lower orders of the value chain. * the characteristics of the stages are why no "one size fits all" methodology works i.e. in project management agile is most suited to the chaotic where deviation is desirable and structured methods (e.g. six sigma) are most suited to the linear where deviation is not desirable. * organisations consists of a mass of activities and therefore can be in different states of the cycle at the same time and even have multiple fronts at the same time (i.e. multiple parts in a state of war). * this entire cycle occurs throughout an organisations value chain and hence from simple premises creates a complex world of management. * linear activities tend to low margin but are stable whereas chaotic activities tend to high margin but are unstable. Creating a profitable and sustainable company requires a constant balance of both. * many of the memes of modern management e.g. "business alignment" are consequences of how we structure ourselves and ignore the impact of evolution. We can see the effects of this model clearly today. For example, cloud computing which is simply the shift of various IT activities from a product to a utility service domain (a more evolved form) which has been initiated by companies not encumbered by the previous model (Amazon etc) and hence have broken the inertia barriers has instigated a state of war. The normal round of customer "risks" (trust, transparency, governance changes etc) have been raised along with resistance from past vendors (e.g. dismissing of cloud). As a result of the state of war, new forms of organisation have emerged which have fundamentally different structures, strategies, practices and activities from the past. At the same time new architectural practices (resilience, scaling) relating to this activity (e.g. infrastructure) have co-evolved and are now diffusing. We have also seen the explosion of new activities built upon these commoditised component services along with increases of un-modelled data which the technology enables us to exploit (hence big data). We should increasingly see the disruption of past vendors who are stuck behind the inertia barriers due to their past success and hence have cultural, institutional and structural barriers to change. Equally the war will spread to other industries through the reduction of barriers to entry i.e. retail banking, insurance etc. I could go on with formation of competitive markets, role of standards etc but it's almost a text book classic of the cycle. The only thing that is surprising is how many people are surprised by the changes. Of course, cloud computing is based upon an underlying component which itself underwent this cycle. That component, which commoditised the means of mass communication, is the internet and it caused disruption (both direct and through reduced barriers to entry) of many industries from media to retail to travel. It also caused explosions of growth, un-modelled data, new practices and new forms of organisation - the web 2.0. Naturally, their practices (e.g social media, social networks ...) diffused amongst those companies that survived and adapted to the new economic state. That was also a text book classic of the cycle. Of course, the internet is a component of the next cycle which refers to the commoditisation of the means of manufacturing - e.g. 3D printing, printed electronics etc. It will have exactly the same effects but then I covered this in talk between 2005-2007 (based upon earlier research) and it's just the same old thing. The above is brief notes and this work was developed from my original models and research pre-2005 which I've used extensively in competition. It's only recently however that I've been able to extend the model to organisational evolution and obtain the volume of data necessary to be confident with the entire model. Its validation required a cycle of change. It'll still require another cycle before its predictive capabilities are fully tested though. None of the above is new to anyone that has been following me over the last five years, in fact it's probably very dull having heard much of it so many times before. I still find the nuances interesting, i.e. why companies in a peace mode that find themselves in a war state often attempt to reduce cost to restore profitability and hence quicken their demise or why you have no choice over evolution (Red Queen) of the impacts of Jevons' paradox or ... well there's lot. However, I'm moving on into how to really exploit evolution of the value chain and play the game. So I thought I'd just put this up here as a brief reminder to the work I've done. Your point that utility of invention is more important is a though provoking one. It is true that businesses can grow when they apply utility of the inventions and technologies to their business. Great observation and very detail. I was able to grasp now, what these innovation has brought us. Actually, it's just adding a feature to an already existing idea before and came up of something new. I bet this also applies to how ecommerce web design companies developed and evolved throughout these years.